Following on from my last post, I am attempting to sort my life out over the next year. Usually something you only consider around New Years Eve, I'm starting now, this October. This month is about getting the foundation right for my year ahead, setting up some habits that will help me remain healthy and hopefully give me some structure to avoid chaos and crisis. My process for this was to write out all the areas of my life I wanted to work on. Not surprisingly, this list encompassed most things, eel, actually, everything. While an outsider may think my life is relatively normal, I do not feel like anything is really working well. I want more. I want better. Mental and Physical health should always be a priority. Work on your weaknesses, exploit your strengths. Go with the flow- Life is not linear and multiple issues will need to be worked on at one time. Seek professional help if you need to. Good things don't always feel good at the time. Staying within comfort zones does not get you very far. To grow you have to push your boundaries. Organisation provides structure that creativity and spontaneity can grow from. Continue projects you are currently working on. This is not a new start, it is a new process. 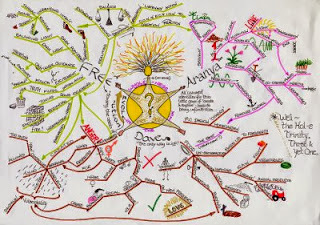 I even did a mind map which looks something like this (just a lot messier). I then created a list of what I would like to achieve by October 2014. This is not comprehensive, rather more an outline, something to guide my monthly goals. I think in my head I need a destination to strive to so that I can start out heading in the right direction. Food/Exercise- balanced diet, healthy weight, body worthy of a personal trainer, worthy of an after photo. Career- have a growing business combining all my qualifications (Nursing, health, PT). Continue working on The Artist's Way and the possibility of using my talents as an income stream. Money- have savings, afford a holiday, be in control of my finances. Work within a budget. Creativity- painting, quilting, sewing, writing,, whatever I choose. My goal is to financially benefit from my pastimes. Relaxations- be free to travel, for work or play. Take a holiday in December 2014 with the children. Stay tuned tomorrow when I will list my goals for this month.